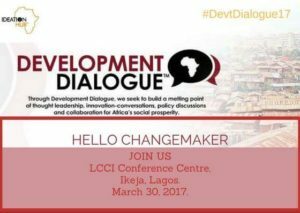 Ideation Hub Development Dialogue 2017 seeks to provide changemakers the knowledge, tools, skill,sector-focused perspective, and a robust network. The much anticipated thought-leadership conference for change-makers, impact entrepreneurs and development practitioners will now hold on Thursday, March 30th 2017, at LCCI Conference and Exhibition Center, Alausa, Ikeja! with Keynote Speeches, Social Innovation Workshops, the BigWhy Project to Networking Hub, Exhibitions and more during the FREE Morning Conference. There will also be an Exclusive Executive Roundtable in the afternoon for forward-thinking and entrepreneurial change-makers, to sit with industry thought-leaders, as we focus on the Enterprise Side of Social, covering social enterprise models, how to profit with purpose, alternative fundraising strategies and telling your innovation story. This session costs N10, 000 only. At the Dialogue 2017, Dr. Oby Ezekwesili (Senior Advisor for Africa Economic Development Policy, Open Society Foundation), Mr. Peter Bamkole (Director, EDC, Pan Atlantic University), Funbi Falayi (Co-founder, Passion Incubator), Adepeju Jaiyeoba (Founder, Mothers’ Delivery Kit), Kunle Adewale (Founder, Tender ARTS Nigeria), Crystal Chigbu (The Irede Foundation) and Ronke Aderionye (Executive Director, AgriHub Nigeria) will be there. The Exclusive Executive Roundtable will play host to industry leaders including Bukonla Adebakin (Deputy COO, Future Project Africa), Sola Amusan (Citizenship Manager, Microsoft), Mfon Ekpo (CEO, Discovery Center), Nneka Eze (Associate Partner and Lagos Office Director, Dalberg) amongst others.